Kimberly M. Grimes’s new book “The Amazon Heist” is a suspenseful and entertaining work of adventure, mystery and culture. Recent release “The Amazon Heist” from Page Publishing author Kimberly M. Grimes is both educational and enlightening; this work depicts a story about an anthropology professor, her class and a journey through the Amazon. 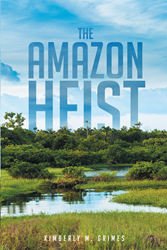 Kimberly M. Grimes, an anthropologist, director of Made by Hand International Cooperative, humanitarian, educated writer, researcher and author, has completed her newest work “The Amazon Heist”: a gripping and profound work that delves into the culture, people and mysteries of the Amazon. Published by New York City-based Page Publishing, Kimberly M. Grimes’s thrilling tale will leave the reader on the edge of their seat through the twists and turns of an adventurous plot. Take a journey to the fascinating world of the Amazon rainforest as seen through the eyes of the native peoples, artisans, students and tourists. Anacondas, caimans, monkeys, shamans, yucca harvests, river cruises, legends and much more come to life in this amusing yet suspenseful book. Follow Elizabeth Long, an Anthropology professor, and a group of students as they travel to the Amazon jungle for a study abroad trip. In this bold adventure, they encounter life as never before imagined, living with a tribe on the world’s mightiest river. The voyage takes a sudden turn when the discovery of diamonds in the area leads to a robbery. It is an event that will cause the students’ lives to converge with two elderly British tourists and two local men who work at the diamond mine, weaving them together in a race to recover the diamonds before time runs out. The book unearths the spirit of the Amazon peoples and recreates the beauty of the rainforest - the sights, smells, tastes, sounds, and dangers of this unique place. A riveting chronicle. Most entertaining is the way in which humorous tales, changing attitudes and the straddling of two very different worlds are revealed by following the visitors and natives’ days. Readers who wish to experience this suspenseful work can purchase “The Amazon Heist” at bookstores everywhere or online at the Apple iTunes store, Amazon, Google Play or Barnes and Noble.